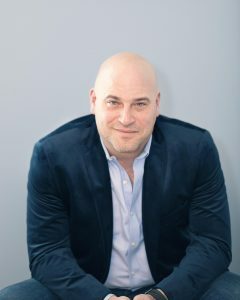 Tal M. Klein was born in Israel, grew up in New York, and currently lives in Detroit with his wife and two daughters. When she was five years old, his daughter Iris wrote a book called I’m a Bunch of Dinosaurs that went on to become one of the most successful children’s book projects on Kickstarter ―something that Tal explained to Iris by telling her, “your book made lots of kids happy.” Iris then asked Tal, “Daddy, why don’t you write a book that makes lots of grownups happy?” Tal mulled this over for a few years, and eventually wrote his first book, The Punch Escrow. 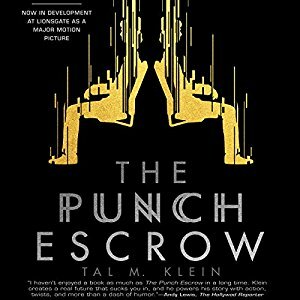 It won the Inkshares Geek & Sundry Hard Science Fiction publishing contest, and is the first book published on the Geek & Sundry imprint. 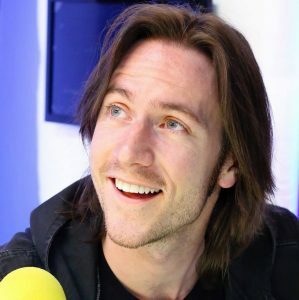 Matthew Christopher Miller, known professionally as Matthew Mercer or Matt Mercer, is an American voice actor involved in English dubs of Japanese anime as well as cartoons, films and video games. In anime shows, he voiced Levi in Attack on Titan, Kiritsugu Emiya in Fate/Zero, Kanji Tatsumi for episodes 13-26 in Persona 4: The Animation and Trafalgar Law in the Funimation dub of One Piece. In video games, he voices Leon S. Kennedy in the Resident Evil series, Jack Cooper in Titanfall 2, Chrom in Fire Emblem Awakening, McCree in Overwatch, MacCready in Fallout 4 and Yusuke Kitagawa in Persona 5. 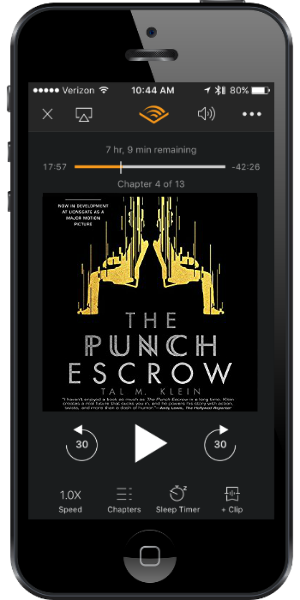 In addition to voice-over, Mercer has developed some live-action web series including a Nintendo character parody called “There Will Be Brawl” and the famous Geek & Sundry and Alpha Dungeons & Dragons gaming session show “Critical Role.” The Punch Escrow is his first audiobook. 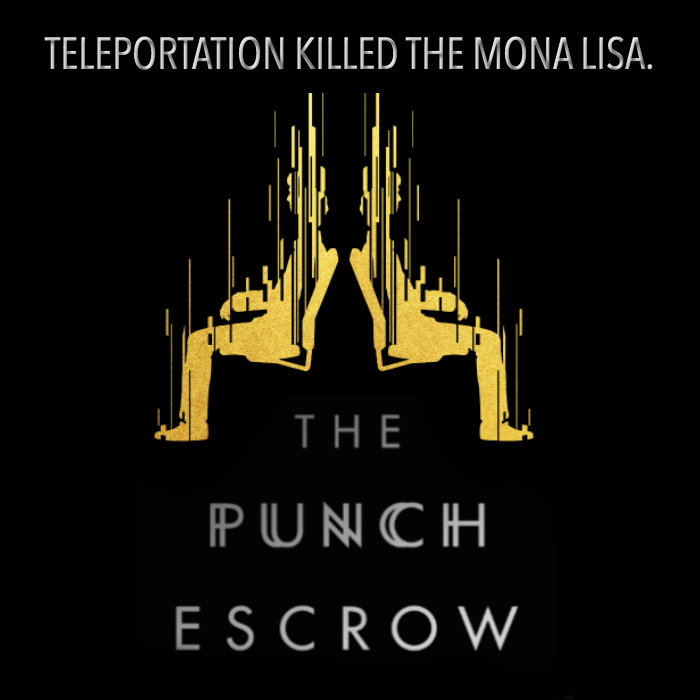 “The Punch Escrow” is one amazing adventure in a world beyond our imagination. Well, beyond my own imagination at least. And experiencing it in audio was worth it. I do not dive into a Sci-Fi book lightly, so for sure listening to the book was a major contributor to my final rating. So the story is as described in the blurb, I will not insist upon that. In a way, the author uses this book to touch some delicate subjects like how the corporations influence our lives or how technology get in conflict with religion. The basic one is that we will become so depended of innovation that we will lose ourselves, we will lose our identity. However, the main character faces common issues in his marriage, which he tries to solve as 2017 people do. There are some funny stories here and there, my favorite being a part describing McDonald’s Big Mac. These elements are told as if it was a known thing, something that is contained in the last…130 years or so. The familiar tone is very enjoyable and the mix between technical terms and common explanations blends very nicely. As for the quality of the narration, I can only say it was really really great. I have never heard a narrator sing J And he does it so well. He is so expressive and so funny. He is your best friend, the one who tells you his crazy story. The audio format is definitely worth your time. I received this audiobook as part of my participation in a blog tour with Audiobookworm Promotions. The tour is being sponsored by Tal M. Klein. The gifting of this audiobook did not affect my opinion of it. How did you select your narrator, Matthew Mercer? I always knew I wanted Matt Mercer to narrate my book, the hard part was getting him to agree to do it. Between Critical Role and his various Nerdist responsibilities, he’s also an incredibly prolific voice actor. Recording an audiobook is a serious time commitment! There was also the challenge of getting Audible to agree to having Matt do the book because he’d never done an audiobook before. Ultimately I got lucky in that Matt read my book, liked it, agreed to do the audiobook, and Audible was easily convinced to sign off once they heard his voice acting reel. The rest is history! How closely did you work with Matthew before and during the recording process? Did you give him any pronunciation tips or special insight into the characters? Matt is a consumate professional. We did one session on pronounciation, but everything else was entirely in his court. I wanted him to make my book is canvas. He did an outstanding job. The Inkshares community is incredibly supportive, so they are owed a lot of credit, but my wife deserves the lion’s share. She was my rock throughout the writing process and the book would have never gotten finished without her support and enthusiasm. I love audiobooks, though I tend to prefer listening to nonfiction. One of the reasons I was so particular about choosing Matt Mercer to do my book is because I knew he would give each chracter a unique voice. I feel like many fiction audiobooks lose me when they are narrated in monotone. Nothing beats Matt Mercer singing Karma Chameleon. That alone is worth the price of admission in my humble opinion. I think the two experiences are distinctly different. As I mentioned, I rarely listen to fiction audiobooks, but when I do it’s usually after I’ve already read the book. A bottle of expensive bubbly with my family and friends!